Notes: An eight-story structure located at the southwest corner of 11th Street and Brazos Street, it has housed the offices of the Texas Department of Transportation since its completion. 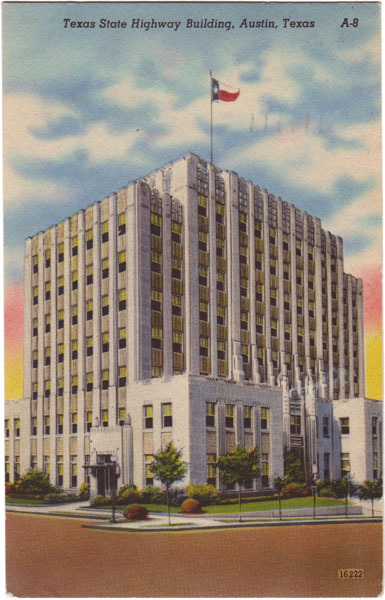 The building was renamed in 1981 from the "State Highway Building" to "The Dewitt C. Greer State Highway Building" after Dewitt C. Greer who was the former state highway engineer and highway commssioner. The building was designed by San Antonio architect Carleton Adams and finished in 1933 at a cost of $455,000. It was the first skyscraper built in Texas that was planned as a state office building. It was added to the National Register of Historic Places 1998. The building occupies the site of one of the first Travis County jails which was built in 1876. Postmark: TAYLOR FEB 17 7PM 1956 TEX.